The reason for the omg, is that I have totally ignored my blog since Sept, as in I did no blogging whatsoever since then. However I’m planning to get back into it more often, as time allows. To celebrate my return back to blog land I am giving away a lovely pair of vintage earrings. 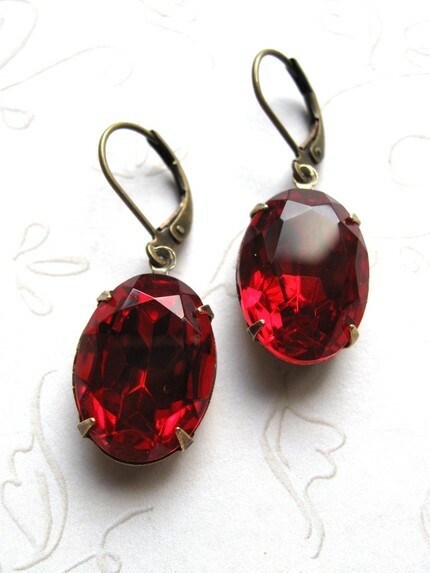 Up for grabs is this lovely pair of vintage faceted red glass earrings! They are sparkling and pretty and perfect for Valentine’s day! To enter to win, please leave a comment in the box stating your favorite thing about valentines day! Drawing will be held on Sun Jan 24th! My favorite thing about Valentine's Day is that I now have someone to spend it with! My favorite thing about Valentine's Day this year is this contest because I LOVE these earrings. Another stellar creation, Cyd! Oh, those are beautiful! I love Valentines day because it makes me slow down and think about the people I love. I just posted about the giveaway on twitter. My favorite thing about Valentine's Day is remembering making homemade valentines, first with my mother using Woolworth's paper dollies and faded red construction paper and gold stick on stars and spraying them–they were really overpowering- with "WoodSong" perfume. Then years later, I made them with my young daughter using paper dollies, pink construction paper, dried flowers, snips of lace, roughly a half pound of glitter per valentine and lots of Avon's "Haiku" perfume. I wish I had saved some of them…. I think it is an amazing holiday because it is the only one designated for LOVE! Everyone (at least in the States) is collectively thinking about LOVE all on one day. It is very powerful!